Steve “Hoss” Smith often sees the world upside down as he flies his Beech T-34 Mentor in air shows across America as a member of the six-man Lima Lima Flight Team. The aerobatic team is scheduled to perform Friday night at the Owensboro Air Show at Owensboro-Daviess County Regional Airport and again Saturday at 1 p.m. over the downtown riverfront. Friday’s hours are 4 to 9 p.m. 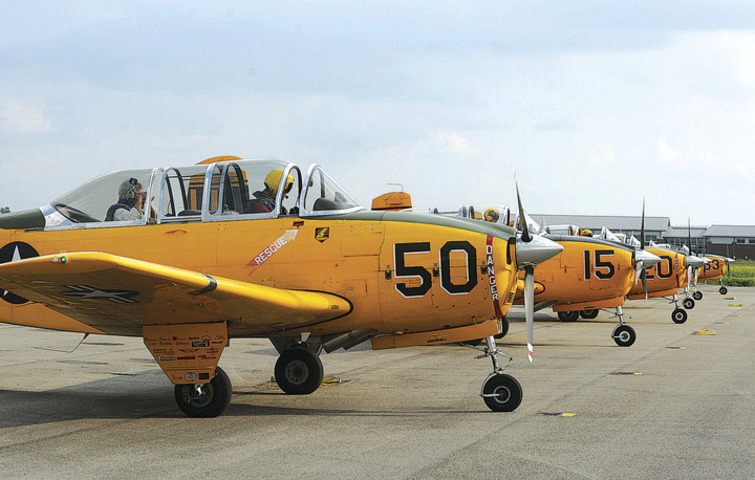 The bright yellow planes, used by the Air Force and Navy to train pilots in the 1950s, fly in precision formation — two to three feet apart — at speeds of up to 200 mph through a variety of aerobatic maneuvers. A picture on the team’s website — http://www.limalima.com — shows the planes diving straight toward Lake Michigan with Chicago in the background. On Thursday afternoon, the Lima Lima pilots took members of the local news media and the business community for a flight above the city to demonstrate some of the tamer moves. Over Spencer County, Ind., they roared through a series of moves that resembled dog fights in aerial combat, soaring straight into the sky and rolling a couple of times above the Ohio River, with smoke streaming behind them. Smith, who lives in Ellicott City, Md., graduated from the U.S. Air Force Academy in 1982 and spent the next 12 years flying F-15s and C-130s. Smith, who’s in his second year with the team, never sees the crowds that stare in awe at the team’s performance. He flies a couple of feet off the right wing of the team leader. The Owensboro show is the team’s fifth this year. They usually fly 10 or 12 a year, Smith said. But the federal government’s sequestration has cut into the number of air shows by limiting the number of military aircraft that can perform. The planes taxi down the runaway two by two and take off that way. Once in the sky, they join up in formation and head out over the city. That makes precision flying even more difficult. When Smith isn’t flying, he’s executive vice president for Survey Operations Arbitron in Columbia, Md. Lima Lima traces its roots to the Mentor Flyers Inc., a group organized in 1975 in Naperville, Ill. Since then, the team says it has performed for more than 100 million spectators. The name “Lima Lima” comes from the FAA designation for Naper Aero Club field — LL-10. “Lima” is the military word for the letter L.
Ride in a stunt plane? Heck, yeah! They asked me last week if I would like to ride along in the back seat of one of the Lima Lima Flight Team’s planes while they practiced for the Owensboro Air Show. Heck, yeah! Who wouldn’t? I’ve ridden in a hot-air balloon, an open-door Huey helicopter and a fire-spotter plane. Why not a stunt plane too? But I wasn’t really prepared for the moment when Steve “Hoss” Smith, the pilot I was to ride with, handed me a parachute. I always assume that planes aren’t going to crash. It gives me a certain peace of mind. But a parachute? That implies that it might. Back in 1999, during a practice session, two Lima Lima planes touched wings and one plane crashed, killing the pilot. I didn’t know that when I was climbing into the Beech T-34 Mentor behind Smith. Anyway, Smith helped me into the parachute, which was heavier than I expected. I climbed on the wing and hoisted myself into the back seat. Then, he helped get me buckled in. If we have to bail, he said, slide the canopy open, remove your headphones, unbuckle the seat belt, stand up, climb onto the side of the plane and jump past the wing. While the plane is plummeting to earth. Yeah, that’s gonna happen. I am really that coordinated. Unless that plane is 10 miles up, it’s gonna be buried in a cornfield by the time I’m ready to jump. Just don’t crash, I said. 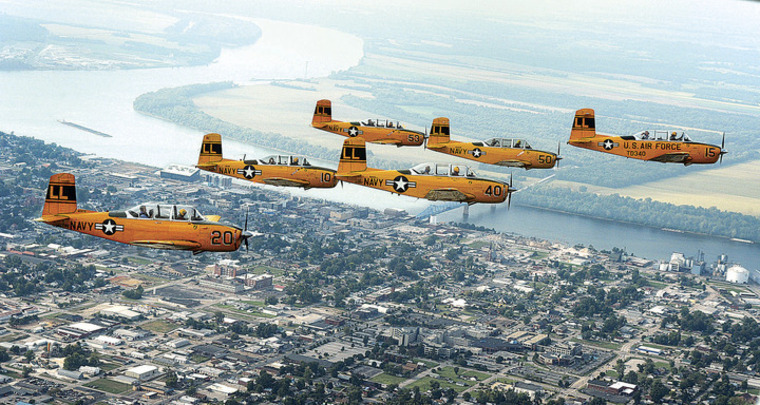 We flew over Owensboro in formation. It was about like flying in any small plane. Except you rarely look out and see another plane 10 feet away. Then, we crossed the river to Spencer County. “We’re gonna chase tail,” Smith said. I grinned. Suddenly, the plane banked sharply to the right and then went into a steep, almost vertical, climb — chasing the tail of the plane in front of it. My grin slid back to my ears and every wrinkle on my face smoothed out as the force of gravity doubled and tripled. Then, I found myself looking up at an Indiana field, the sky, an Indiana field and the sky again. A bit disorienting, to say the least. Especially when you’re trying to take notes.